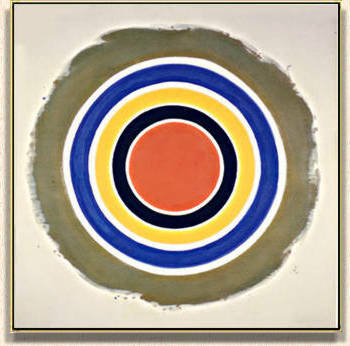 SOMETIMES CALLED "TARGETS" the centered images painted between 1956 and 1962 consist mainly of concentric circles in different colors centered in a square canvas. Although some have non-circular centered motifs these are referred to generally as "Circles." The first "Circles" were painted freely, but this practice was replaced by mechanical geometric drawing (at first surrounded by a loosely painted outer penumbra) which produced a characteristic target or roundel motif. If the circle motif was chosen originally for its associations or symbolism that practice was soon abandoned. By the early '60s Noland preferred the motif because it provided a convenient framework for relations of color unencumbered by convention. These relations were reinforced by the expanding and contracting rhythms inherent in the format. A sense of immobilized pulsation was an integral part of the expression in these paintings, which became a kind of Noland "trademark." These were the first pictures of Noland's to depend for their success upon relations of clear colors stained into unsized cotton canvas. Noland's color vocabulary was relatively limited at this point, often relying on primaries and unmixed pigments -- variants of simple fauve color. It grew steadily in complexity from this point on.